North Atlantic right whales are an endangered species. They got their name because whalers considered them the ‘right’ ones to hunt, due to their amounts of oil and blubber. It was about four years ago when the sightings first began. In the beginning, just a few fishermen reported seeing large black whales in the Gulf of St. Lawrence, in areas clustered off the coast of Cape Breton Island. With each summer came more sightings. One was seen off the north coast of PEI. Another off of Pleasant Bay at Cape Breton Highlands National Park. A couple off of Southside Antigonish Harbour. Soon, the reports were in the dozens. The sightings were initially treated as a passing curiosity. The North Atlantic right whale, a rare and endangered species distinguished by patches of roughened white skin, had been seen off the coast of the Gaspé in Quebec before – though few could recall ever seeing them in this part of the gulf. But then came the deaths. That's when everyone started paying attention – especially the fishermen. Researchers examine one of the North Atlantic right whales that have died recently in the Gulf of St. Lawrence. 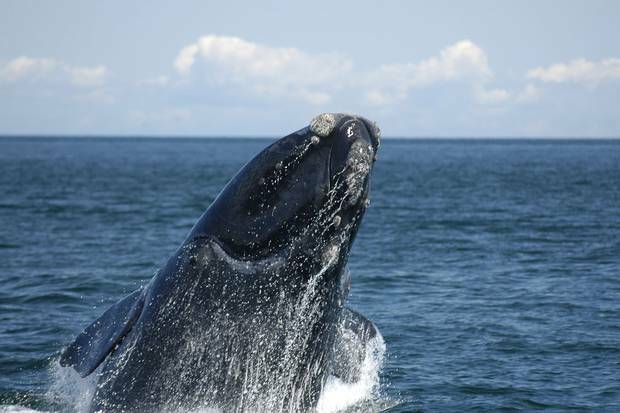 The first whale was discovered in the first week of June of this year, found floating west of the Îles-de-la-Madeleine in the south-central area of the gulf. The whales are so-named because whalers considered them the "right" ones to hunt, owing to their enormous amounts of oil and blubber, and also because this means they float once they've been killed. Five more dead whales were found later that month. At least one was found entangled in fishing gear, others with evidence of being struck by ships. The crisis further escalated after a whale rescuer, Joe Howlett, was killed trying to disentangle one. 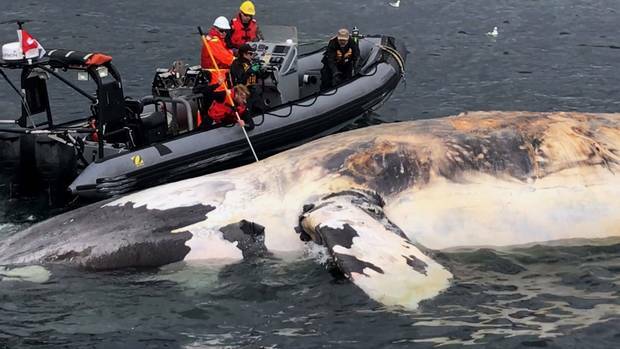 In total, there have been eight dead whales found this summer alone in the Gulf of St. Lawrence – a devastating figure, given only 524 North Atlantic right whales were previously believed to be in existence. The deaths have raised alarm bells around the globe and is being described as an "unprecedented die-off" by various conservation groups. "It's catastrophic," said Sean Brillant, the manager of marine programs at the Canadian Wildlife Federation. "We're talking about almost 1.5 per cent of an entire population." The deaths have left officials scrambling. In the second week of July, the federal Department of Fisheries and Oceans announced a temporary closing of fisheries in one small area of the gulf. Then, late last week, DFO announced it would suspend all snow-crab fishing across a larger swath of the gulf for the rest of the snow-crab season. No one knows why the whales began appearing, or where they came from. All the local fishermen know is that they seem to have made their home in the gulf. And now, the many industries that rely on the waters will have to figure out how to live alongside them. More whale entanglements could lead to more fishery closings – potentially affecting the many other fishing industries in the area, and underscoring the unpredictability faced by those who make their living off of the ocean. More than 50 different species of fish and seafood are harvested from the Gulf of St. Lawrence every year, with a value of more than $467-million annually. The presence of right whales could also affect the thousands of commercial ships that travel through the gulf each year – leading to possible route diversions or the movement of shipping lanes. "All options are on the table at the moment," said Matthew Hardy, division manager in science for the Gulf Region of DFO. He said that until the DFO has a better grasp on the reasons behind the sudden appearance of these whales, and better data on their distribution patterns, it's too early to talk about potential solutions. "I don't think anybody can predict the future." Such moves would have "a major, major impact," said Leonard Leblanc, a retired fisherman and managing director of the Gulf Nova Scotia Fleet Planning Board. He predicts the right-whale issue will plague his and other industries for years to come. "It's going to be massive in scope," he said. obsolete as whales swim continuously. that there are no whales present. As of 4 p.m., July 26. Note: exact locations are obsolete as whales swim continuously. No sightings does not mean that there are no whales present. A few years ago, the whales did not return to the Bay of Fundy. In most years, North Atlantic right whales migrate in the winter to the areas off the coast of Florida and Georgia. And in the summers, they travel to Cape Cod Bay in the U.S., or to the Bay of Fundy in Canada. But when the numbers of sightings decreased sharply, stymied researchers began searching nearby waters. Around the same time is when the sightings in the Gulf of St. Lawrence began. At least a few of the whales spotted in the gulf this summer are ones previously seen in the Bay of Fundy. Still, researchers say there's a chance that increased sightings could just be the result of increased surveillance efforts. If in fact the same whales have moved to the gulf, there could be a number of reasons, Mr. Brillant said. A natural "boom and bust" period for food sources (typically zooplankton and krill) could be responsible, he said. As could changes in weather patterns. He said it could also be part of a regular cyclical pattern for these whales – "where maybe every 10 years or so, they move." Aside from snow crab, Mr. Leblanc said locals are also worried that the whales could affect other fisheries. In particular, "fixed gear" fisheries – where traps or lines are set up and left alone for a period of time – pose a risk. This would include some of the gulf's most valuable fisheries, including lobster and groundfish, such as cod and halibut. "I think potentially all fisheries could be affected," Mr. Leblanc said. Aside from concerns about conservation, the local fishermen have an economic incentive to avoid the whales, too. A single encounter with a whale – even one that doesn't lead to a fatality – can cost a fisherman thousands of dollars in lost or damaged gear. And if a whale does become entangled, disentanglements can be dangerous. After the death of Mr. Howlett, the whale rescuer, Ottawa put on hold all further disentanglement efforts in the area. More than 50 different species are harvested by commercial fisheries in the Gulf of St. Lawrence, bringing in an average annual value of about $467-million. The top five species, in value, accounted for 88 per cent of this total. The gulf fishermen may find their solution by looking to their neighbours in the Bay of Fundy, where fisheries have grown accustomed to interacting with the whales. In most years, the whales migrate south by October. But in 2006, the whales remained in the Bay of Fundy well into November, and DFO threatened to implement full closings just as the lobster season was about to get under way. Working together with the federal department, the local fishing industry was able to put in place a series of policies to avoid whale interactions and also avert closings. "We realized it was best for the industry to take the lead on this … which is better than being told to do something," said Melanie Sonnenberg, project manager for the Grand Manan Fishermen's Association. One important part of this was putting in place a hotline that fishermen call each day before heading out on the water for information on whale sightings and locations. And they've run education campaigns with local fishermen, emphasizing what to do when they see a whale (encouraging them to report the sightings), and what to do if there is an entanglement. They've also moved shipping lanes away from known whale habitats. In recent weeks, they've been swapping notes with gulf fishermen so that the latter group can learn from their experience. "We've dealt with it for a long time," Ms. Sonnenberg said. "The folks in the gulf are just getting started, so it's a big learning curve for them." On their own, gulf fishermen have also been researching the effectiveness of new equipment designed to avoid such entanglements. In the U.S., some fishermen have started using quick-release gear where the rope breaks away in the case of an entanglement. U.S. regulations designed to protect marine mammals will come into place by 2022, requiring Canadian fishermen who export their products south of the border to use such equipment. But Mr. Brillant said there's limited evidence that the equipment makes a difference. The only surefire way to prevent further entanglements, he said, is to limit human interaction with them – which means fishery closings. Earlier this year, even before the deaths in the gulf, Mr. Brillant released a paper urging summer closings of two areas in the Bay of Fundy known to be critical right-whale habitats. With the recent events in the gulf, he said it's clear that further closings will have to take place there, too. "We're not looking to turn the ocean into a wildlife preserve … we just need to change to recognize that there is more than one purpose of the ocean – it's not simply a driver of economics for Canada. It's also a part of who we are," he said. In general, he applauded the gulf fishing industry's help in looking for a solution. Fishermen, he said, "are not interested in needless harm being done to the environment." But what has been missing, he said, has been sufficient government intervention. "The government hasn't done enough on this," he said – especially critical given the many different industries and jurisdictions involved, including Quebec, New Brunswick, Prince Edward Island and Nova Scotia. He compared it to the problem of drivers hitting and killing moose on the highway. "If you hit deer … it's just a terrible situation for both sides," he said. "There's not necessarily blame or accountability, except for where we put the road, and why was the road put there?" Mr. Hardy, the DFO scientist, said that in the case with the gulf, the department has been "very proactive." He pointed to the planes and boats the department has deployed in recent weeks to track whales in the area, and to the six necropsies they've conducted in the past month to try to determine the causes of death. The department has also asked those travelling through the gulf in ships to voluntarily reduce their speeds for the rest of the summer. "We've been very active in responding to this situation in a timely manner," he said. Mr. Brillant is not convinced. "We just need to make sure we're not going to drive this animal to extinction," he said. "This could certainly happen in our lifetime." 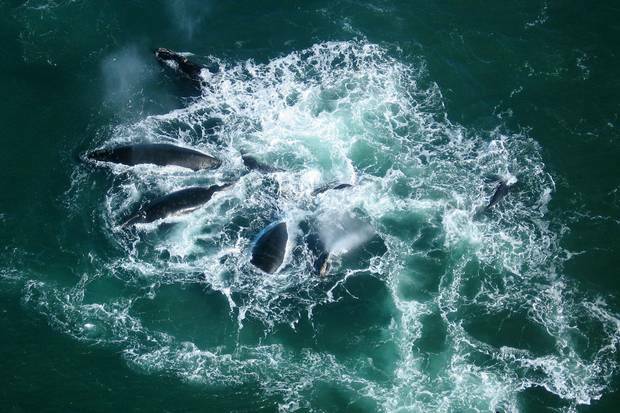 A group of North Atlantic right whales is spotted in the Bay of Fundy on Oct. 13, 2006. Researchers are able to tell the whales apart by the patterns of rough, white skin created by small crustaceans clinging to them. Researchers at the New England Aquarium in Boston have created over the course of several decades a catalogue of all of the North Atlantic right whales known to be in existence. Because of their distinctive markings – raised patches of rough skin that appear white because of "whale lice," small crustaceans that cling onto them – researchers are able to distinguish between individual right whales, giving them names and creating a record of all their known activities. The catalogue has within it 722 whales in total, a figure that also includes a number of which have already died, and many that haven't been spotted for decades. "Scimitar," for example, a female whale with "lots of white spots" on her underside, hasn't been seen since 1985. "Droopy," a whale with scars on her chin, hasn't been seen since 1983. The most recent whale found dead in the Gulf of St. Lawrence, on July 19, was a male named "Peanut," with a recorded date of birth of 1991. His mother is a whale named "Baldy," who, according to the catalogue, may still be alive. Despite the New England Aquarium's efforts, tracking whales is a finicky business. Other animals can be captured and tagged – sometimes using a tag through their ear – but this isn't possible with whales. Sometimes, researchers are able to attach a suction cup with a transmitter to a whale, but these typically fall off after just a few weeks. "We perceive these things as very large animals, and think they should be easy to track, but the ocean is even larger," said Sean Brillant of the Canadian Wildlife Federation. "Case in point – we lost an airliner over the Indian Ocean a few years and ago and still haven't found it." 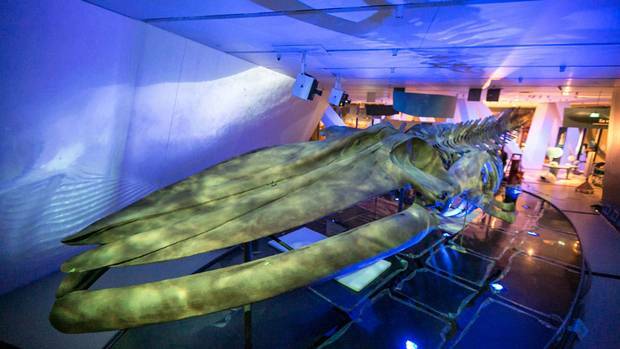 The ROM’s blue whale: Thar she blew, now here she be When nine blue whales died off Newfoundland’s coast in 2014, researchers began a massive undertaking to take one of them apart and show the world a titan of the deep up close. Madeleine White explains how the skeleton ended up at the Royal Ontario Museum. 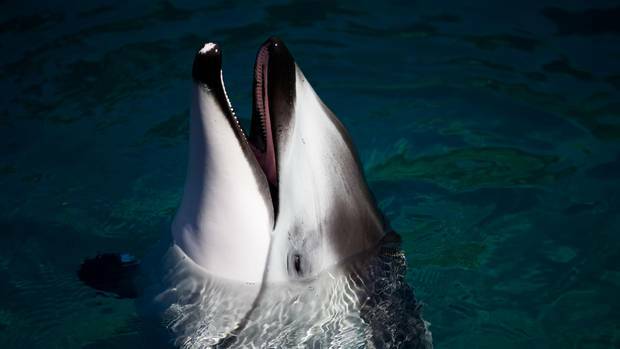 Vancouver aquarium caught in international debate about cetaceans in captivity Ethics, emotions and money mix in a debate about keeping whales, dolphins and porpoises on display, Adrienne Tanner reports. 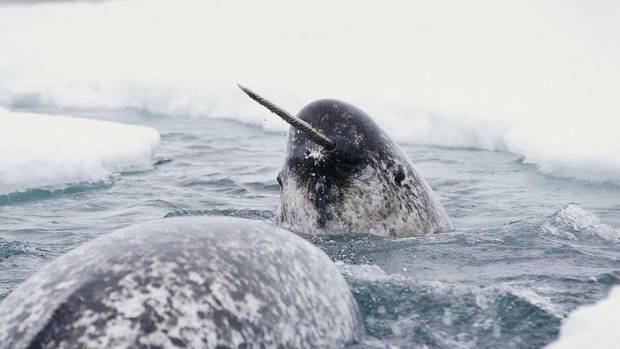 Narwhals use their tusks to club and stun prey, scientists discover Surprising behaviour caught on camera is part of a growing picture of the feeding patterns of one of the most enigmatic of all whale species, and could help inform efforts to conserve its Arctic habitat, Ivan Semeniuk explains.